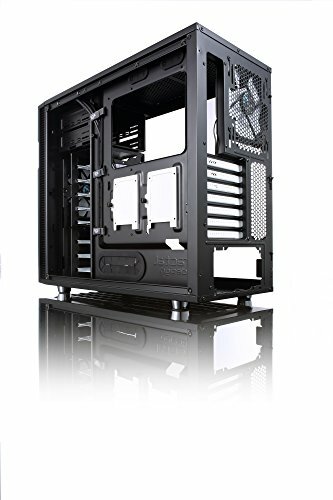 There are two obvious choices on the market right now for silent case: Fractal Design Define R5 or NZXT H440. And same as countless discussion and debate over the internet, I have a hard time to choose which case I want to build on initially. NZXT H440 really has some really impressive lighting, especially the one at the rear I/O. However I eventually picked the Fractal Design Define R5 w/Window (Titanium) due to its awesome Scandinavian design and clean look. The titanium color front panel gives a level of sophistication into my first build as oppose to the high-contrast, glossy color top vent in NZXT H440 . And that ultimately lead to my consideration of the titanium/gunmetal color matching when I am buying my components. The ModuVent™ fan vent covers is an incredible design which gives builders options to balance cooling performance and acoustic/aesthetic. The abundance of rubber grommets and zip tie locations makes cable management a lot easier. The sound-damping material of the case significantly reduce the noise from the components inside and I am really glad I make this right choice. Nice case! Simplistic, full featured, and big enough for my needs. The side panel window also makes the build look cool. looks like Stonehenge to me. it is kinda quiet unless i open the front door or put my ear close to it. the hdd slides kinda fit on cage so when i pulled out i scratched the sides. The case is spacious. There are 3 cages, one for optical drives, one for 5 drives and the other for 3. In addition there's actually a hidden plate on the top of the optical drive cage and could be used to hold anything. I might use that instead of the 2 optical cage. I was able to remove the 2 drive cages to make more space for airflow. 2 fractal fans came installed and are noisier than the corsair cooler fans. 1 at the front and 1 at the back. I could still hear a humming sound even with the all the panels closed. Like the bottom and filters. I wish the window was bigger, right now it is a little bigger than 1/2 and less than 2/3 of the case. 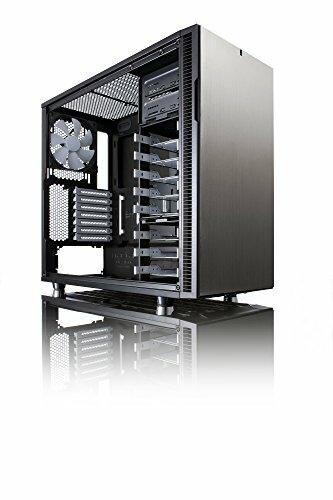 Great case and quality build and very quiet. If I had to do over again I probably would get a full tower just to have more room. With 3 GPUs it gets tight. Bought this one because it was one of the better looking sound dampening cases - and it does live up to its hype. Due to space constraints my rig is literally inches away from me but I can barely hear the fans or the HDs running. I would have preferred that they shipped with another 140mm fan. Another problem is the plastic side-panel scratches really easily; so I left the outside protective film on..